1/8" square wire, marked sterling bangle. 1/8" square wire sterling bangle, 4 semi precious stones, frosted finish. 3/8" wide hammered sterling segments (3). each segment has 3 semi precious stones,copper bezels, brass connections. 1/2" wide. alternating semi precious stones and copper and brass rivets. 1/2" hammered sterling bangle scattered with semi precious stones, and mixed metal shapes. 1/2" 8 sided sterling bangle. sides alternate with semi precious stones and mixed metal shapes. 3/8" sterling bangle with copper rivets. very solid unevenly hammered sterling bangle with 3 mixed metal rings. 1/4-3/8" wide. 6g solid hammered marked sterling bangle with 4 semi precious stones. this bracelet is easily worn in multiples and looks fabulous. 7/8" sterling bangle. each is truly unique and has a scattering of mixed metal shapes, brass charms, and semi precious stones. 5/8" wide. each has a slightly different look being handmade-true of all of my work, but more obvious in some pieces, like this bangle. this is not my dog's favorite piece as it is noisy to make!! 1/2" sterling bangle with copper domes and markings. 3/8" hammered sterling, 1/8" square copper, brass rings. 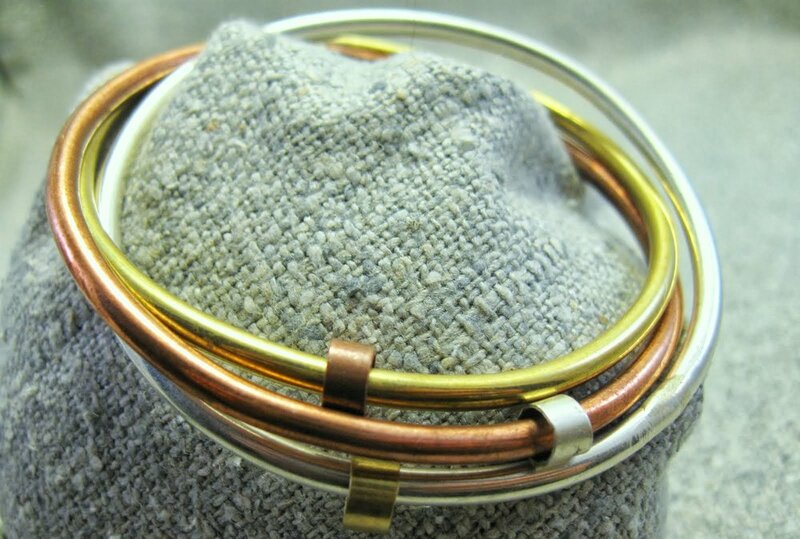 3 intertwined mixed metal bangles. each has a contrasting piece of tubing. 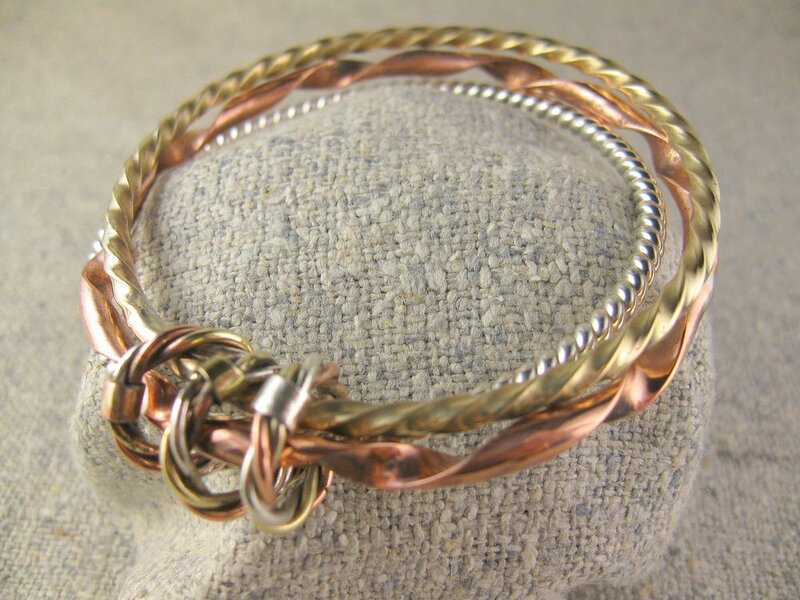 brass, copper, and sterling hand twisted bangles joined by 3 mini twist mixed metal rings. twisted sterling/copper bangle and brass bangle joined by 3 tri metal tubing pieces. half copper, half silver, brass rings. 6 gauge solid bangle.